You know Trim Healthy Mama is my THANG if you’ve been around here at all. I’ve reviewed the book, tracked my progress, written articles, and posted lots of recipes. But today on Trim Healthy Tuesday, I’d just like to focus on your questions about the plan, the book, the food…anything you want to ask. A. My rule of thumb on snacks is that I shoot for eating every 3 hours or so…no more than 4 hours between eating. The reason behind this is that the body really is amazingly equipped at ‘adjusting’ your blood sugar levels and metabolic rate if you go too long without fueling. Your brain runs (pretty much exclusively) off of glucose, so your body stores it for times of need. If you’ve ever had a sugar spike and crash when you’ve skipped breakfast, then you know that shakey, magnified-nerves on edge feeling of your blood sugar skyrocketing and then crashing. Your body releases stored glucose from your liver and muscles in an effort to ‘feed’ the brain. If you push yourself into this position often enough, the metabolism down-regulates, so you’re using less fuel overall, and storing more to compensate for ‘starvation’ periods. You REALLY don’t want to suppress your metabolic rate if you’re trying to lose weight. Trust me. This was the pattern I was stuck in prior to Trim Healthy Mama, and I probably ate fewer calories overall back then, and had HORRIBLE blood sugar fluctuations. NO MORE! So: short answer- work meals and snacks into your schedule every 3-4 hours, providing a mix of S or E fueled meals to keep that metabolism BURNING hot, and mix in FP’s to pull deeper from your stored fuel (aka chub). You can adjust your meals and snacks to fit your daily routine or lack thereof…THM can be totally personalized to your lifestyle. Some days, it helps me to set a timer, or to keep easy snacks on hand in the fridge, like the yummy lemon or choco puddings above (pp 366-367). I make a big batch and pour them into 1 cup jars for us to grab at snack time. A. My favorite ‘slump’ snack is a piece of fruit and an iced coffee with a bit of protein powder stirred in. I love fruit, and I find that it’s a great pick me up in the afternoon to have a ripe peach, and sip something cold and delicious. A. Well, the rule of thumb is that snacks and meals should have a protein base, but that’s not written in stone. I’d say “most” of your snacks and meals should have a decent protein source. Like the book says, I sometimes snack on popcorn, or just grab a piece of fruit, but I find that adding in some protein really curbs my appetite for much longer, so I can last that 2.5-3 hours between meals that you want to shoot for. A. Ew…I REALLY dislike aftertaste, and I’m super sensitive to it. I find that the trick with aftertaste is finding a REALLY good stevia, and not overdoing it. I don’t think adding other flavors really helps much if your sweetener is bitter or has an off flavor. Stevia has a ‘weak’ sweetness that doesn’t do a very good job covering over bitter flavors in food (cocoa is a good example), so using a blend of erythritol and stevia sometimes helps with this. Adding just a pinch of salt to your recipes will really round out the ‘weak’ flavor of stevia as well. I always start small with my measurements of stevia, and build to a good sweetness. So far, I’ve loved NuNaturals original formula (which they’ve now CHANGED…BOO! HISS! ), and the NOW Better Stevia Extract. The NOW stevia is fluffier, so you get about 30-50% more in the jar, and you have to use about 30-50% more shakes to get the same sweetness. I have found that I really prefer the taste of my own homemade ‘truvia’ made with 1 cup of NOW Erythritol to 1/2 t. NOW Stevia. As far as vanilla goes, I really like Simply Organic Brand or Frontier. My VERY favorite, though is to buy some vanilla beans and soak them in some rum over the summer. SO YUMMY! 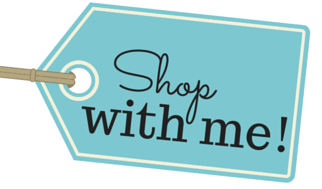 You can find all of these items on page 3 of my Trim Healthy Mama Oils and Flavorings store. 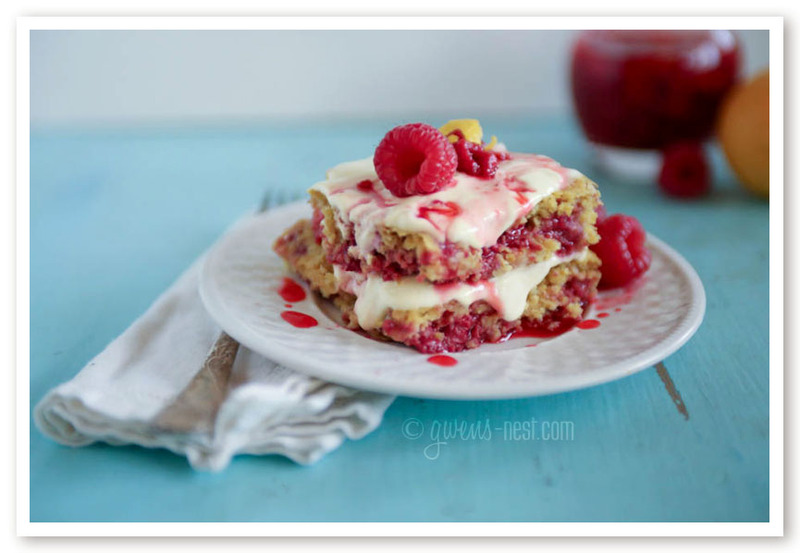 The raspberry oatmeal cake above is made with oat flour…I tweaked this recipe from the Strawberry Shortcake Muffins over on the Dashing Dish. I’m playing with the oat fiber that I bought through Amazon…it’s a great ingredient for Fuel Pull treats and baked goods! A. Hi Constance! I’d be happy to suggest some E breakfast choices! 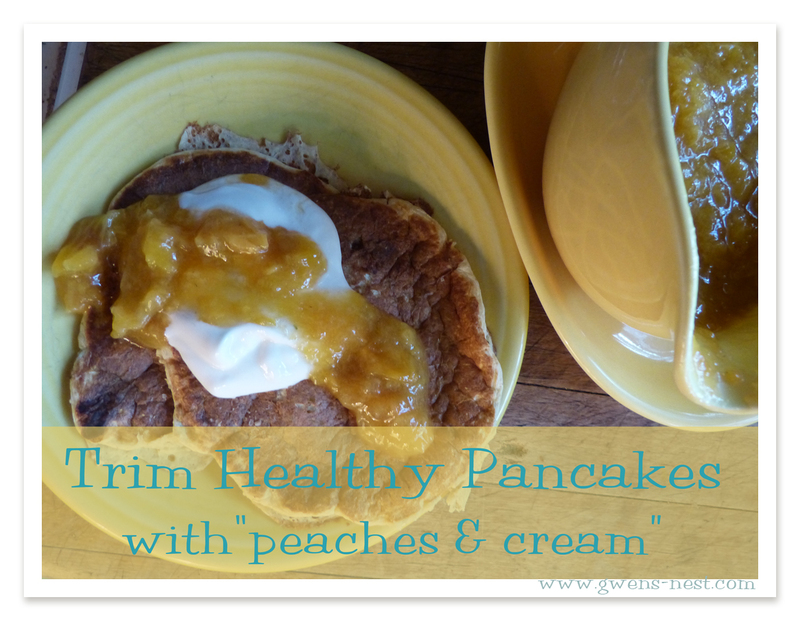 The chapter on Breakfast grains has some fantastic E recipes including the Trim Healthy Pancakes (p. 223) pictured in this post. I make peach ‘sugar free syrup‘ to go on them…SO delicious, and packed with protein! I sometimes enjoy this breakfast with a piece of turkey sausage as well, to add just a little more protein and ‘holding power’ if you know you’ve got a busy morning lined up. Another favorite for me is to make a ‘rice pudding’ with almond milk, and add cranberries to it. (see above) And it would just be WRONG if me to not mention Stacy’s AMAZING Baked Oatmeal Recipe, that’s totally my favorite right now. The Cookie Bowl Oatmeal (p. 232 in the Original book, or p. 249 in the Trim Healthy Mama Cookbook) is a Fuel Pull option, but you can easily switch it to an E by adding half a piece of fruit. Pages 247 and 248 in the new cookbook offer other E variations on the them of oat bowls. A good bowl of oats like this FILLS me up, so I might do half a bowl with half of an apple or orange. Hope you enjoy! A. I understand that…I had a hard time getting all of that into my brain at first. I had never had to think of food in that way, and sadly, most of my foods contained lots of both carbs AND fats. I’m a really visual learner, so I printed out the charts on the Facebook group and taped them into my cabinet to reference. But I think an even better way to do it is to go check out the Trim Healthy Mama Pinterest Boards, and you’ll start to see themes emerging on the E and S boards. The E and S chapters in the book will also give you a lot more ideas and recipes. I PROMISE you, as you work through and start playing with recipes and foods, you’ll have a ‘click’ moment, and it’ll all seem SO much easier after that! A. Hi Shayna! I looked up a basic pudding recipe, and here’s what I found regarding converting cornstarch to xanthan gum. The corn starch recipe used 1 1/2 tablespoons of starch to thicken a cup of milk. The pudding recipe using xanthan gum used 3/4-1 teaspoon to one cup of liquid. So that’s approximately a 5:1 ratio of corn starch to xanthan gum, if my math is correct. Xanthan and gluccie can be used at a 1:1 ratio, and I’d suggest using 1/8th teaspoon per cup to start out, and going up from there. The 1 teaspoon per cup ratio is going to give you a very thick end result. A. Hi Peta! Yes, Xylitol is another great option that does not cause a rise in blood sugars or insulin. The book talks more about using Erythritol, but they can really be used interchangeably. I do like to caution people that some may have ‘bowel’ issues while adjusting their diet to Xylitol, so it’s best to start small. Erythritol is usually a safe bet starting out. Boooooo!! Hiss!!!!!!!!!!!!! I agree. Blast that NN. Polenta is a pasta product, right? That would not be on plan, as it’s going to spike the blood sugar too quickly. Have you tried quinoa? It’s a seed, and is great as a seasoned side dish, but it’s a slow carb and a great E option. Polenta is a ground corn, like grits. Thanks for hosting! I love THM Tuesdays! Hi, Gwen! Thanks so much for your posts. They are so helpful and encouraging. I do have a question though. Although the book says every meal should be based on a protein, it doesn’t particular identify “proteins”. Foods like quinoa, nuts, seeds, and beans have lots of protein, however, they are listed as either fats or carbs. How do I know if a food is a fat or a carb or a protein if it has more than one characteristic? Since foods are made up of all different macro nutrient profiles, some will definitely be in both protein and S (fat fueled) categories. Steak for instance. Oats and beans (both E) have a smaller amount of protein, and since they’re plant based, they don’t contain a ‘complete’ protein or amino acid profile. It’s OK to occasionally rely on these as protein sources, but I find that adding in dairy (0% Greek yogurt for instance) helps the meal ‘stick’ with me longer, and provides the rest of the amino acids for a complete protein. Basically, you do want recognize the fuel (fat or carb) that a protein source is offering to the meal. Usually, seeds, nuts & animal products are S unless you’re using a defatted aspect like egg whites. Grains and beans are E.
for the easy bread that is…. I’m loving all the great info and recipes. I’m waiting for my THM book and am trying to start incorporating some of the basics into how I’m eating now. But my question is this… Can you eat fp , s , and e meals on the same day or are you supposed to keep them on separate days? Snacks also ? I just started THM 1 month ago I think I’m a turtle I have only lost 3 lbs.. I have a question about your easy bread! Do you eat the bread with E meals & S meals? I’m confused about eating bread with an S meal. I love your blog!! I added the page markers it’s helped out a lot. 2 slices for an E setting and you can add one to an S meal to create an S helper. Per day? You’d just have to see how many carbs your body does well with. 🙂 Enjoying it once or twice a day is probably great for most people. But be sure to mix up your carbs with fruits from time to time too. You want plenty of fruits and veggies happening. What is the difference number-wise of an s snack or s meal, as well as an e snack or e meal? I am also interested in the answer to Tammy’s question. When does a snack become a meal ? Great question, and sorry I missed it before. 🙂 I’m not a numbers person, and there isn’t an official answer with numbers. So I’ll tell you from my perspective: I count a meal as a main protein with veggies and side dishes. I sit down to eat my meals. 🙂 A snack is like a mini or light meal, but usually with only one or maybe two items served (and one of them is or contains protein), and I eat it usually standing at the counter in my kitchen. The link for the quick start guide is not working properly. I keep getting an error code: HTTP 404 Web server cannot find the file or script you requested. Please check the URL to ensure that the path is correct. Can this be corrected, please? Thank you SO much for letting me know! I’ve corrected the link, so you should be able to access it now. So sorry about that! Have you seen the THM Quick Start Guide that I put together? It does contain a shopping list with ideas on where to find products. As far as *what* to buy, that will really depend on how you do THM, and what types of recipes you like. If you’re doing lots of low carb baking, then the baking blend or buying the low carb flours (coconut, flax meal, almond) are a great move. But you can also keep it super simple, and just stick with meats, veggies, fruits, and items found in the grocery store. Hi Gwen. I’m a THM newbie. I’ve been on the plan for a week and am experiencing a bit of light headedness and super low energy. I have my E meal in the morning and my S meals later. I have a snack when I need one but I’m not sure what might be causing that feeling. Have any ideas? The other thing to consider is the possibility of a food allergy or sensitivity. Do you notice feeling warm or cold after eating certain things? Is this your first time using stevia? Why did my peanut gems fail? I followed the recipe and the batter was liquid. Any ideas what I did wrong? THM is a whole new learning curve. I have had several recipes fail. Simple ones like the root beer float recipe has flopped. Please help. But I can commiserate with a big learning curve with lower carb type flours and recipes. It's like relearning things in the kitchen, but if you follow someone who really has a handle on the recipes, then you'll pick it up faster. There are SO many great bloggers out there now doing lower carb and Trim Healthy Mama! My peanut gem batter is soup also. Hi – I’ve been doing THM for two weeks or so faithfully, sporadically for a couple weeks before that. Even though I continue to read and read and read, I am still having trouble wrapping my brain around certain ideas. (I think past dieting has left me too “rules-based.”) As far as protein sources – like THM Pancakes – is the protein the cottage cheese? Or in Crockpot Oatmeal – is it the oats? Protein is bored into my head as meats/eggs and I’m having trouble figuring out if I’m getting adequate protein in those type meals. So far it seems too good to be true, so I’m anxiously waiting to see the scale move. ::Keeping fingers crossed. :: Thanks! Great question. 🙂 For protein, you really do want to make sure that you’re getting some with each meal, but it doesn’t have to be limited to meat or eggs. Greek yogurt, dairy, egg whites (can be added to smoothies or into oatmeal even!) and even gelatin or collagen are all good options in meals where you aren’t adding in eggs or meat. 🙂 You’ll get the hang of this, once you get comfortable with all of these little details. Not *every* meal will be high protein, but so long as you have a good protein source in there, it works. The oats themselves do have a little bit of naturally occurring protein, so it’s fine to occasionally enjoy just a bowl of oatmeal if you like. I find that my blood sugar stays more stable if I add a little more protein with oats though. Why is splenda not liked on this plan? Trying to find this answer everywhere. Great question. Splenda is what’s considered an artificial sweetener. The THM plan is about improving overall health, and they consider naturally derived sweeteners to be a healthier option over time. However, a few of the (for occasional use only) convenience foods on the plan *do* contain small amounts of Splenda, like the Carb Smart Ice Cream. The downside to Splenda on the issue of overall health…the jury is still out on that one, and new research is exposing some really serious questions about its safety for long term use even at smaller doses. Like this study that links the use of Sucralose (Splenda) in small doses to negatively alter your gut flora. I decided to go ahead and write a full post on this with citations and links if you’d like to learn more about Splenda Side Effects. I ‘ve completed three days on this plan (and seen some weight loss – yay!) but I’m finding it hard to come up with E meals. Any tips? Can I eat too many S’s? You can *definitely* get too many S meals in. E meals and snacks are just FP meals with some healthy carbs added in. Look at the list in the book of E foods, and find the ones that are contributing carbs. They’d be the grains, beans and fruits. It’s important to think of them like that, instead of thinking of “breads and pastas” as carbs, because so many of the THM recipes and product recommendations are breads and are low to no carb. So keep the grain idea in mind when looking for good E foods. I like the sesame sprouted bread as toast! If it would help, you can see me do one meal 5 THM ways here. Is homemade kefir, made with fat free store bought milk, THM friendly? Can I use as FP snack? Or for An E breakfast mixed with old fashioned oatmeal and berries? I know we are not supposed to drink fruit juice, but I haven’t seen vegetable juice (like V8) mentioned. Is that acceptable? Also, if you have a FP snack with a FP beverage, do you have to be concerned with it becoming a crossover? With juices, you just want to remember that liquid carbs move into the bloodstream faster. 1 cup of V8 is 8 net carbs…I think that’s a lot higher than any other drinks on THM. So I’d enjoy your veggies whole with all of the fiber. It’s a lot gentler on the blood stream that way. Re: stacking FP- technically yes. If you have a FP coffee drink with the full amount of fat, then your snack shouldn’t have additional fat, or you’re into a light S. I don’t go crazy with this or actually calculate every single gram of everything, but I do try to be mindful. Hi Gwen. Love your page. I have a question. Is Grapefruit & Cottage Cheese considered an “E” meal? Hi. I’m wondering why Dreamfields pasta is on plan for THM, but GF brown rice pasta isn’t… or is it? Any sort of grain based pasta is going to spike blood sugar pretty fast. Dreamfields is a special formulation that for most people digests more like a protein than a grain. It doesn’t work for everyone, but it’s a nice option if it works well for you. Hi Gwen, was just wondering. The meal plan says that we can eat greek yogurt, but where I live I can’t seem to find that triple 0 greek yogurt. The only kind I can find is the one that has sugar in it. I went and bought two big containers of it. There aren’t any sugars in the ingredients list, so where would the sugar be coming from? Would it be from the lactose that’s in the skim milk that was used to make it? And would that yogurt be a good greek yogurt to use. For reference the yogurt is Danone Oikos Greek Yogurt. It has 0% mf, plain, 8 carb, and 4 g of sugar per 3/4 cup. Hi Kendra! I’d opt for a good grassfed collagen instead if you think you’ve got dairy sensitivities. (afflinks) The THM Collagen is good, as is Great Lakes, Bulletproof, and (my best buy) Custom Collagen. I tried stevia and the tru sweetener over the summer and they gave me horrible headaches. I use a tiny bit of regular sugar in my one coffee a day sometimes 2cups. Is this diet plan still ok for me to follow. I don’t want to put more money into a different sweetener and get the same results. THM is about using low glycemic sweeteners, so using real sugar would be off plan…but I think you can still get a lot of benefit from implementing the plan in all other areas. 🙂 I have a few friends who don’t do well with Stevia, and they use an off plan sweetener occasionally. It does slow down their losses, but it’s worth it to them. Another alternative would be to try different low glycemic options…often if you’ll contact the company they will send you a free sample. 🙂 Best of luck! Hi Gwen! Thanks for all your hard work, it really helps us “begginners”. I looked all over the internet and I could not find if cocoa butter is on plan. I was wondering if I could make the “Skinny chocolate” with it and some Gentle sweet for an S treat. Thanks! It sure is! Cocoa butter is the healthy fat in chocolate, and is low glycemic. I have yet another question for you. I am just starting the THM plan and just wondering – in the morning I ALWAYS have coffee. That’s not something I’m willing to give up so I was glad to see that it is on plan. I added cream and sweetener to it so it would be an S. However, I drink it at work and tend to drink it slowly through the morning. I might get my first cup at 10:00 and not finish it till almost 12:00. I go to lunch around 1:00. So does that mean I have to also eat an S lunch in order to keep on plan? They don’t recommend using fueled drinks as “sippers”, because your body becomes used to constant low level fuel coming in. Part of the plan relies on taking breaks between meals and snacks, and mixing up fuels. I have a FP recipe that calls for 1/2 cup LF cottage cheese. Could I replace that cottage cheese with LF Kefir and still remain FP? Or would that oush it to S?